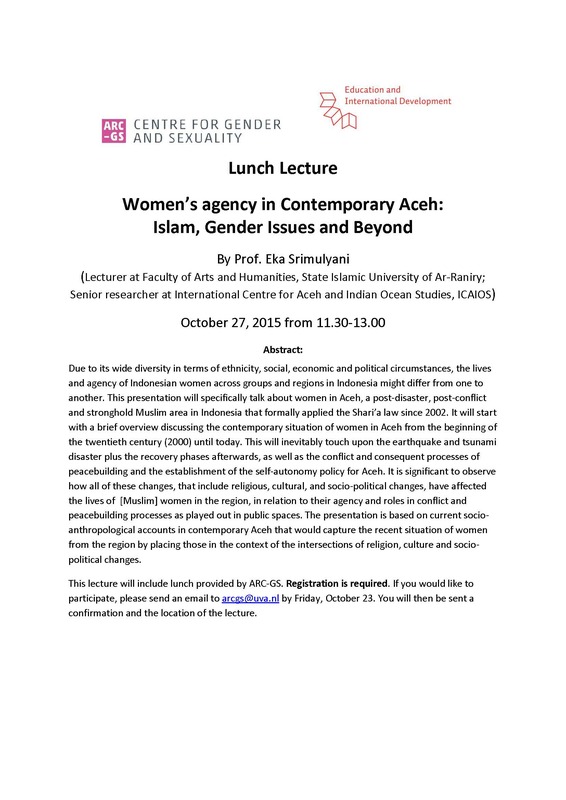 The IS Academie Education and International Development/ Governance of Inclusive Development (GID) co-organised a lunch-lecture with ARC-GS Centre for Gender and Sexuality on “Women’s agency in Contemporary Aceh: Islam, Gender Issues and Beyond” by visiting professor Eka Srimulyani (State Islamic University of Ar-Raniry; ICAIOS). The presentation specifically talked about women in Aceh, a post-disaster, post-conflict and stronghold Muslim area in Indonesia that formally applied the Shari’a law since 2002. It pays particular attention to the observation how religious, cultural, and socio-political changes have affected the lives of [Muslim] women in the region, in relation to their agency and roles in conflict and peacebuilding processes as played out in public spaces. Date and time: October 27, 2015 from 11.30-13.00. More background information: please see our ‘research projects’ page on female education leaders for peace in Aceh.